Our second day in Saint Petersburg was completely dedicated to the Royals. 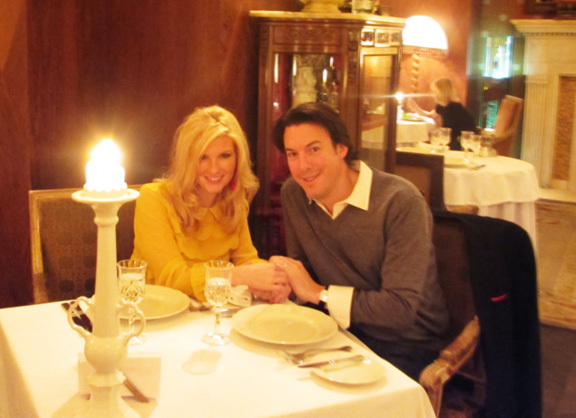 It started with a trip to Pushkin to visit the summer palaces and ended with a fine meal at Tsar. Pushkin seems a bit like the Hamptons of Saint Pete…sans beach of course. In addition to numerous Royal Palaces, modern-day Pushkin is full of summer houses belonging to Russia’s upper class. 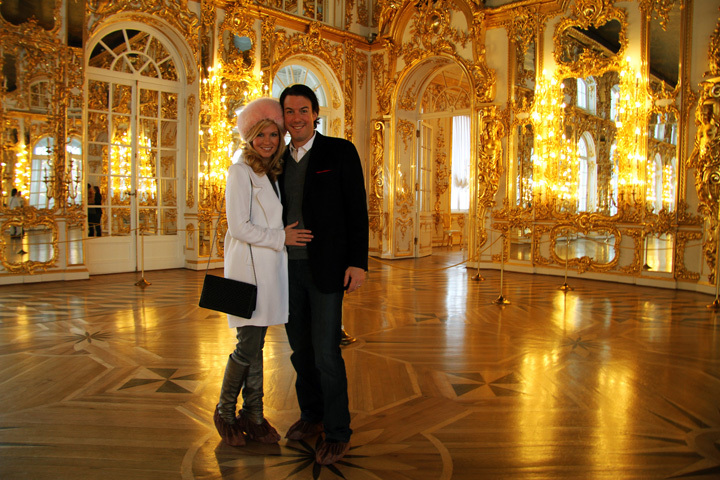 Our first stop was Catherine’s Palace – nothing if not over-the-top. Gilded…gilded…everywhere! 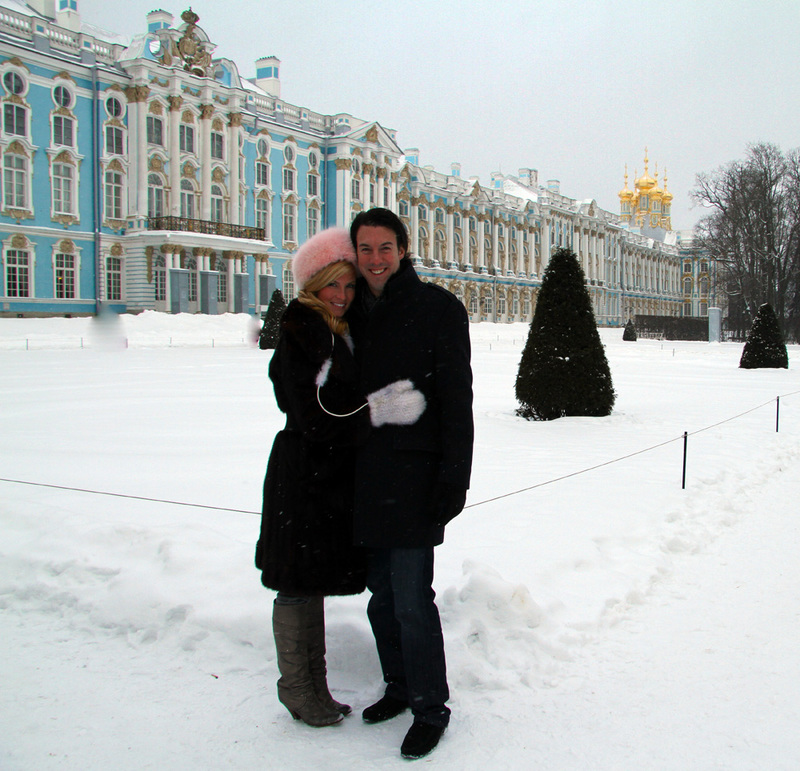 It turned out that our decision to brave the freezing cold in order to visit Russia in the winter and fulfill our Dr. Zhivago fantasies had other perks…NO other tourists. We ultimately had all of the Royal Palaces to ourselves. I don’t think any of these pictures would have been possible in the summertime with wall to wall people. The main staircase inside The Catherine Palace. I think I tour guide did a nice job snapping this picture! 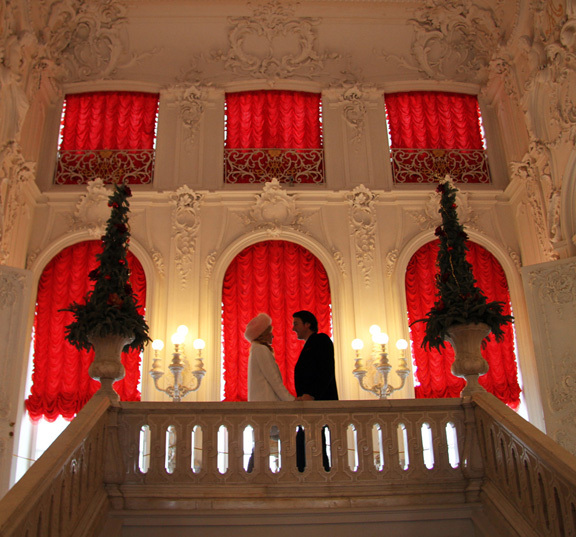 Before touring The Pavlovsk Palace, commissioned by Catherine II (i.e. 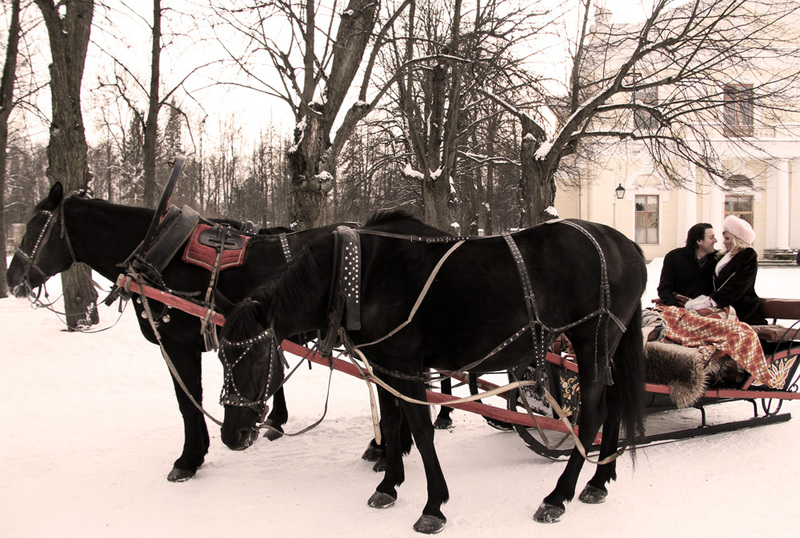 Catherine the Great) for her son Paul, we decided to take a little sleigh ride in the beautiful and freshly fallen white snow! To be honest…it was almost (okay it was) too cold for this frosty little ride. But I knew that we could not come back from Russia and tell my Mama Jean (my 80-year-old grandmother who loves snow and all things Russian) that we did not take a “Troika” ride. After Pavlovsk Palace, we toured The Alexander Palace, built by Catherine the Great for her favorite grandson, Alexander I. Of course the Palace itself was quite grand, but it was the history of it that intrigued us most. This palace eventually housed the last Tsar of Russia – Nicolas II, and it felt more like a home than any of the others. 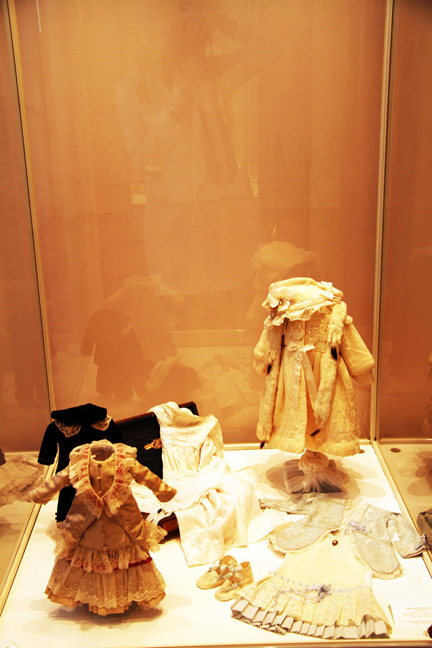 My absolute favorite display case of all is pictured above – Romanov baby clothes. They really put Baby Gap to shame. At the end of a full day of trekking through palaces, we decided to treat ourselves to another meal of traditional Russian cuisine at Tsar. 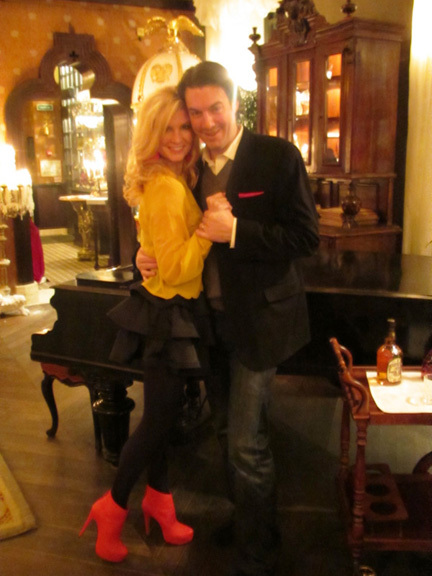 More caviar…more vodka…and their delicious cherry dumplings! Stay tuned for Royal Russia – Day 3! Looks great – I am going there in May this year so looking forward to it even more now – thanks! Ok, I’m really digging all of the cultural photos and info…but what I’d really love to see are more close ups and info on how abibj decided to outfit herself for a winter vacation in the land of the tsars! You are absolutely right! I would have said,”You didn’t ride a Troika? And did you have sleigh bells?” I know it was terribly cold , but wasn’t it worth it? I saw Catherine the Great’s traveling exhibition when it was in the US and it was splendid. Have you seen just lots of Fabrege eggs? By the way , you all look so beautifully dressed yourselves!